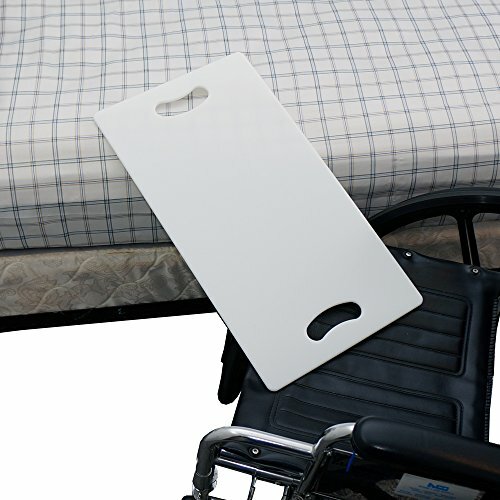 The MTS Medical Supply SafetySure 23" Plastic Transfer Board helps the patient transfer between surfaces of similar or slightly different heights. If you have decreased upper body strength, work with a caregiver to help you transfer. Using the industry standard of "a third, a third, a third", place one third of the board on the surface you are transferring from, place another third onto the surface you are transferring to, and the remaining third is the space in between the two points you're transferring from/to. Support your body weight on the flat surface as you move slowly and carefully paying attention to your movement and the location of your body as you transfer across the board. Don't drag your buttocks on the board. Keep your body in the correct position keeping your feet flat on the floor throughout most types of transfers. When transferring, never put your hands or fingers under the board. For tips on how to use the transfer board, work with your medical care provider, caregiver, or visit YouTube.com for tutorials uploaded by medical professionals.